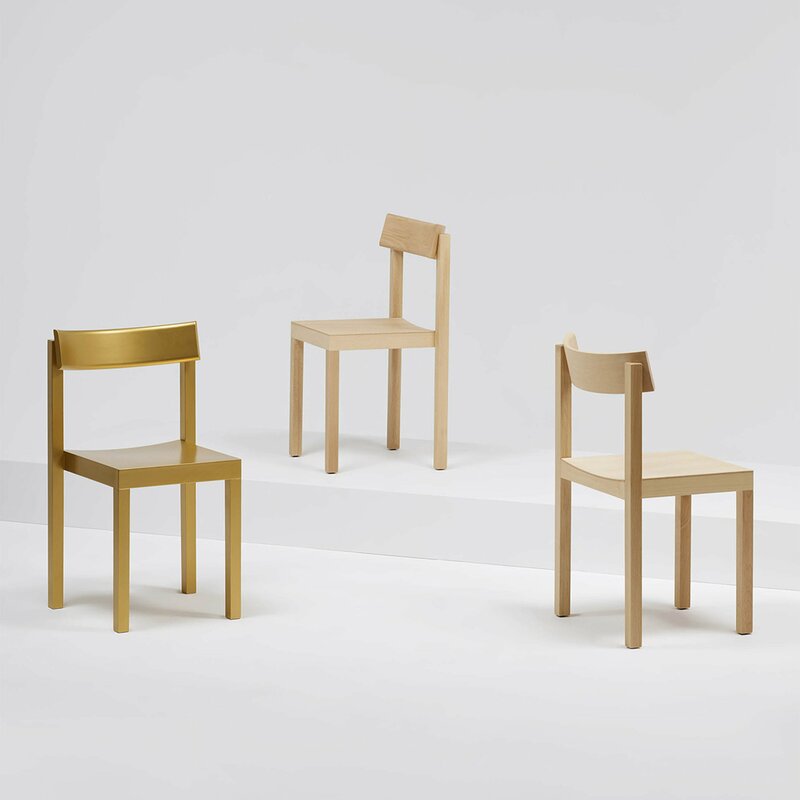 German designer Konstantin Grcic has created a straight-legged “archetypal” chair for Italian furniture brand Mattiazzi. Unveiled at Milan design week, the Primo chair has been designed using only the most stripped-back elements, with its plain square seat sitting atop four “strictly vertical” legs, chosen by Grcic to give the chair a “strong architectural presence”. The back legs extend upwards to support a curved chair back, which has been slightly tilted to lend the chair some comfort, as well as contrast its straight lines. Grcic previously created a bench-like chair for the Italian furniture manufacturer, using flat sloping planes of wood. The chair, which is designed for home environments as well as public spaces, comes in beechwood as well as black lacquered and gold finishes. There’s also an upholstered version of the chair made from solid oak. An accompanying Primo table mimics the shape of the chair with four plain vertical legs, each of which is detachable, allowing the table to be shipped flat. It is available in an additional finish of Fenix laminate, which was first developed for kitchens, and protects from heat, scratches and fingerprint marks. Mattiazzi, which is based in Udine in north eastern Italy, also unveiled a new collaboration with the Bouroullec brothers, a minimal ash lounge chair, at this year’s Salone del Mobile in Milan. The brand has previously collaborated with London studio Industrial Facility. Grcic originally trained as a cabinetmaker before studying design at the Royal College of Art in London. He set up his own studio in Munich in 1991, and has created furniture, lighting and products for Cassina, Vitra and Muji. He ranked 14th among designers on Dezeen Hot List – a data-driven power list of the top designers, architects and brands. The post Konstantin Grcic designs “strictly vertical” Primo chair for Mattiazzi appeared first on Dezeen.